Season meat with herbs and pepper. Cut barding fat into strips. If very salty boil it for five minutes to remove extra salt. 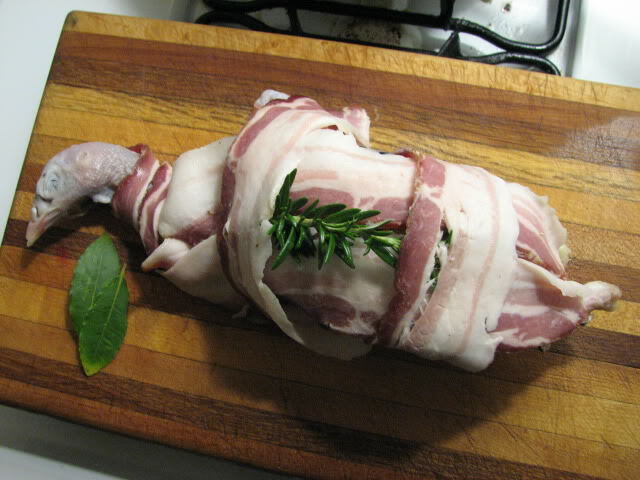 Cover the entire body of the poultry or meat with the strips. Secure each piece with by tying it with kitchen string. First wrap the string around the middle of the meat, secure it and wrap it lengthwise around the meat and secure it. Then make a series of loops width-wise down the length of the roast. Turn the roast over and tread the string through each of the loops and tie it down. Put the roast in a preheated oven. About 15 minutes before fully cooked remove the roast from the oven. Cut the string, remove the barding and return the roast to the oven letting it cook uncovered until done.